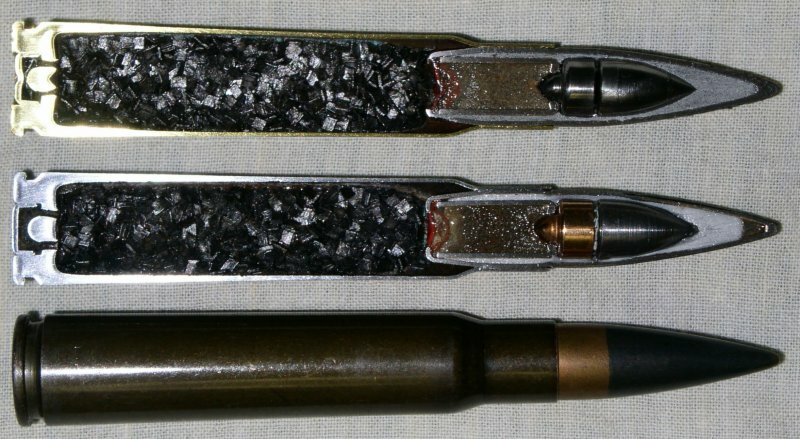 7.92 x 57 mm German Self-destroying practice armor-piercing tracer cartridge. Very rare and scarce cartridges, with only nine complete cartridges known in the world. Identification is by the 20mm-long black tip and red primer annulus. Bullet weight approximately 155.85 grains (10.10 Grams approximate). Bullet length approximately 1.469” (approximately 37.3 m/m). Overall cartridge weight approximately 365 grains (about 23.65 grams). The heat from the burning tracer composition provides ignition for the explosive cup charge. The rear of the explosive cup charge was filled with either black powder or compressed pistol propellant as a priming charge. Ignition of the priming charge (by the tracer composition) initiated the main explosive charge. The explosive charge was composed of 40% PETN, 45% lead azide and 15% tetracene. St+ indicates use of an improved steel case with lacquer finish, in this case. German training charts about various Übungspatrone show this round as being manufactured with lacquered steel or brass cases. It is not certain any were actually loaded in cases made of the latter material. The numbers “6” and “41” identify the lot number and year of manufacture of the case only - Lot number 6 of 1941. There is no way to know who loaded these rounds without the box label, as headstamp data pertains only to the cartridge case. Fragments recovered from a fired round. After detonation, the splinters travelled forward in the direction of fire for an additional 700 meters and fragments also travelled 100 meters to the side. (a) Daniel W.Kent, German 7.9mm Military Ammunition, 1888-1945, page 49. (b) Input from IAA forum members.